Editor's Note: There are two maps associated with this press release. 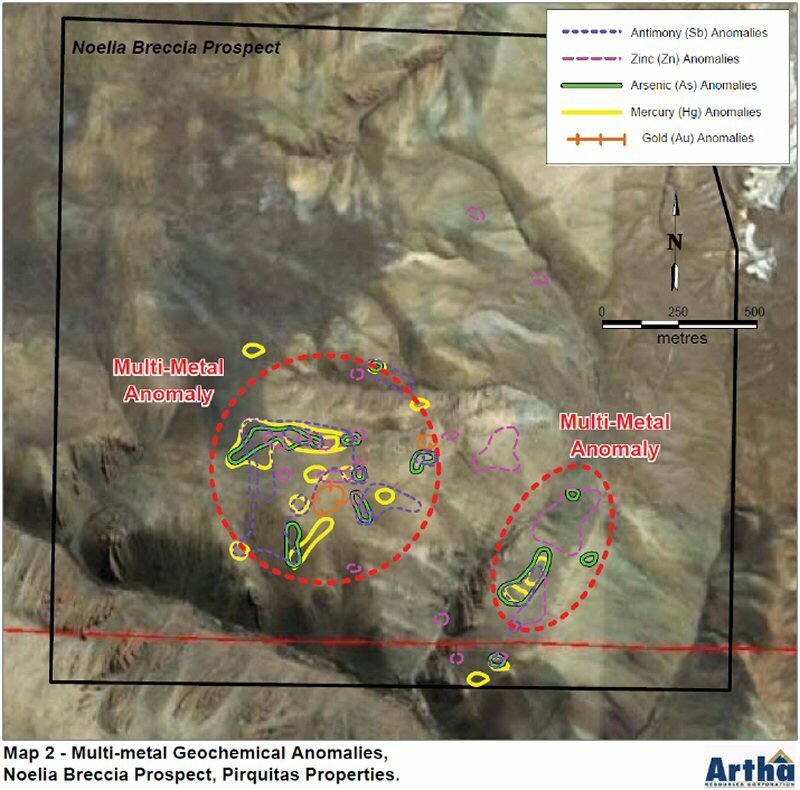 Artha Resources Corporation (TSX VENTURE:AHC) is pleased to announce that the company has successfully completed follow-up work on the Noelia Breccia Prospect in NW Argentina (Map 1), adjacent to the Pirquitas Silver Mine. The results are again very positive, delineating geochemical and geological targets consistent with the surface expression or a telescoped epithermal low sulphidation deposit. A number of drill targets have been recommended to test the anomalies. 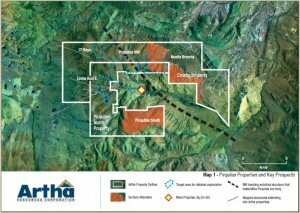 Artha will complete an induced polarisation (IP) geophysics survey prior to drilling to provide a better understanding of the sub-surface geometry of the mineralisation. This survey is planned to begin as soon as possible. The Company considers the results highly encouraging with further work planned to continue on this and other prospects in the area immediately. The Noelia Breccia Prospect straddles the Crosby and Pirquitas North properties in Jujuy Province NW Argentina, which both surround the Pirquitas mining property on three sides. 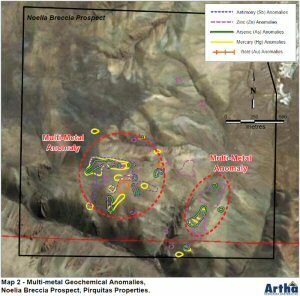 The prospect was initially identified as part of reconnaissance work completed in late 2009 and lies two km to the N-NE of the Pirquitas Mine, which commenced commercial production in 2009 and is expected to produce over 7 million ounces of silver this year. The mine is the largest primary silver mine in Argentina and the fifth largest in the world. The latest work program consisted of detailed mapping and surface sampling at a scale of 1:10,000, over an area 700 hectares. Surface geochemical sampling was completed on a 100 x 100m grid with systematic sampling of structures. A total of 212 surface samples were collected, of which 20 were duplicates to control QA/QC. Samples were sent to ALS-Chemex laboratory in Mendoza Province for preparation and to Lima, Peru for analysis. Four hand samples were selected for petrographical analysis. Mineralogically the Noelia Breccia Prospect corresponds to a low sulphidation epithermal system with obvious quartz veinlets and breccia textures with intense silicification. The breccias are controlled by faults and fractures within both E-W and NW-SE cross-cutting structural systems. The host rock is a conglomerate (debris flow) with strong quartz-sericite alteration and silicification in an area of approximately 1.2 x 0.8km. The silicified structures consist of sets of unidirectional veinlets with dimensions of between 100 to 500m in length and 1 to 5m in width. The scale of this breccia and its associated alteration halo is considered indicative of a broad and potentially large mineralised system. The geochemistry from the recent work provides two large and strong anomalies (Map 2) with multiple correlated pathfinder metals, consistent with the signature of a low sulphidation epithermal system. The anomalies are delineated by elevated arsenic-antimony-mercury-lead-zinc and copper values over broad areas. Gold is also elevated in a small number of samples. The dimensions of the highest priority anomalies are approximately 450 x 180m and 200 x 100m respectively. The results provide further excellent geological support for continued rapid and aggressive exploration on these Pirquitas properties. The Company is preparing for the upcoming field season with geophysics, surface geochemistry and mapping continuing with the aim of beginning a well defined drilling program in the northern-hemisphere this Spring. 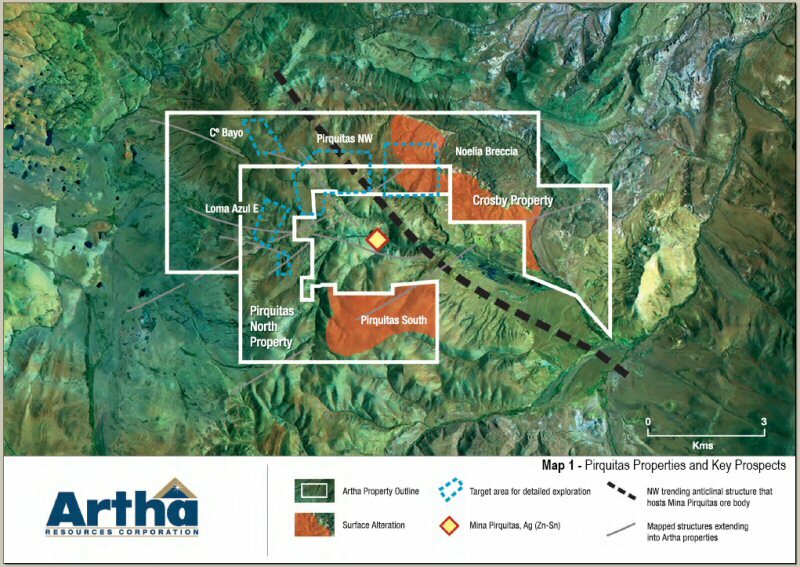 Artha's CEO, Charles Straw, commented on the results by saying, "The continued success we are having on the Pirquitas properties in the very short time we have had teams on the ground demonstrates, not only that our methods and techniques are working well, but as importantly, the properties are delivering as we hoped they would. I am very pleased with results and success to date and look forward to getting the next phase of work underway on these very exciting projects." Charles Straw, B.Sc., is the qualified person under NI 43-101 responsible for the technical information in this news release. Artha was founded by a team of mining industry professionals with a proven track record in project generation, exploration, mining and finance. The team's primary goal is to build Artha into a world class mining company, focused on the discovery, development and mining of economic minerals deposits globally.